Blog from Koh Tao, Thailand | Margaret in Wonderlands.. I arrived in Bangkok and found a cheap place on the Khoa San Road where I slept for a few hours then showered and headed out. As I passed a restaurant I spotted Paul from Vietnam and Laos so I joined him and a friend for breakfast. For the rest of the day I just hung out and wondered about. I met a few random people, a nice girl from England who had been travelling for 3 years. We chatted over our PadThai for 30bahts which was scrummy yummy. I also met a guy from Israel and we hung out for a bit. It's so easy to get chatting to people out here J Later I headed off to the southern bus station to catch the government bus but my taxi driver took me to the other side of Bangkok L The worse thing was I knew it was happening and i kept asking him but he seemed to know where he was going.. I was seriously thinking I would miss my bus at7.50 but I managed to find an American thai girl with a guy who put me in a cab with instructions for the taxi driver. He honestly drove like the wind and we arrived dead on 7.50. Luckily there was a bus at 8.30 heading to the same port so it was all good. The bus had loads of room and we got some free food and drinks so I was happy. Even if I was a bit paranoid about my bags and anyone touching them. It was just so frigging annoying as I spent about 1400 for this journey when I could do a cheaper but probably not saferbus.. oh well one of those things. I arrived in Koh Phangan about 11am and headed to find Jayas Dorms, it was a bit of a mission but I eventually found it. I found out instead of being in the 16 sleeper dorm I was actually in the 24 sleeper. It turned out to be the best thing ever as the whole room was full of cool people and we all got on so well.I joined Jamie and Jenna on the beach both from Canada and Leo from America.. later on we met our other roomies.. Nat, Ross, Jason and Eddie from England, Laura from OZ, Claire, Katie and many more but those are the ones that I spent most my time with. The island is MAD its packed and it's a small beach Had Rinn so it reminded me of a little Tenerife or something.. people there just to party hard and boy did we party hard J I went out on the first night but after 6 days of travelling and little sleep due to various trips I headed to bed about 1ish. However I did join some people on mushroom mountain and no I did not get involved in any of that action.. I just observed people getting wasted on mushroom shakes and other 'stuff'. About 4 the party animals came back and were smashed. The next day I hung out with the lovely Nat and we had lunch and sunbathed. It was cool to have a good girly chat about lots of stuff and we hit it off J We both had a keen love for the fresh doughnuts which were made near our apartment and managed to eat at least 2 a day haha. Later that evening we headed out and partied on the beach after drinking several buckets ;) I made it to 4am on that evening and it rained in the middle of the night so we just danced in the rain. It was a funny funny night..I did also see Caine and his friends for dinner earlier which was cool. Sadly that was the last time to see him as he has now headed home. Miss you Caine! 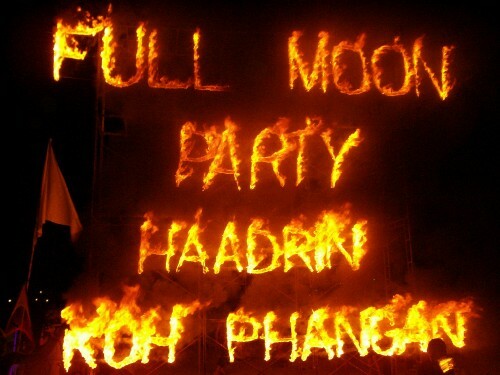 The next day was the Koh Phangan full moon party. After 4 hours sleep I headed to sleep on the beach and chill out.. we spent the day hanging out there. The music started on the beach about 4pm, the party was getting ready to start.. when i headed back to the dorm people sleeping so I took a nap as well. We then got showered and ready and headed out for a big dinner to get ready for it. When we got back to the dorm we spent a few hours painting each other.. Jason was my artist and he did a fab job. I should never get a tattoo as i was a bit obsessed with the paints and wanted more and more on me J It was so much fun and we got pretty wrecked on the buckets as well. There must of been at least 40 people in our area. I headed to the beach with Nat, Jason, Eddie, Ross, Kirsty, Simon, Dee, Nick and a some others. We just partied and moved around the beach to different bars. There was some crazy crazy s*** going on and people passed out in the sea.. You will be happy to know I did not end up there J There were slides which went through a fire ring and skipping ropes on fire.. highly amusing to watch but I bet it was damn painful if it caught you. We slowly lost our group in the maddening crowd. We had made a pact to stay awake until sunrise. I watched it with Jason, Eris, Eddie, Dee, Kirsty and Simon. It was beautiful and we headed back to sleep but the party was still going strong haha. On the way i picked up a baguette from a bakery (as you do). It was a brilliant night and we had so much fun. We found out both Ross and another guy had been robbed and we heard some scary s*** about people being drugged as well but I was thankfully ok..I woke about 6 hours later and we spent the day chilling out watching films. One was Anchorman which I have never watched, bloody hilarious. I had my daily doughnut intake J That night everyone was a bit monged but we headed to the beach for a few hours. Claire, Nat and I did have a chicken schnitzel on the way haha..Ross, Leo and Nick were on a serious mission to get wasted so we had a good laugh at them (sorry guys, love ya) A bit later Nat, Jason and I headed back to get some sleep. Nat made these amazing bracelets for everyone in our little gang, me, Jason, Ross and Eddie. I LOVE IT and it meant so much to receive it.. Thanks again Nat J She was a brilliant girl and we were both very similar so it was so cool to meet her and hang out for those days..Nat and Nick were leaving early the next morning for Phi Phi and I was leaving for Koh Tao with Katie and Claire. The next day I arose early to practice in the pool but I just could not do it L we went and did some more theory then an exam and broke up for lunch and we would head out on the dive. Neil and Jeremy were going to practice it with me in the sea and if I still struggled then no diving for me. It was too risky in case I panicked when diving and caused some damage to myself. I tried again out at sea but had now developed a nice talent of spitting out my regulator, loll. This was definitely not good so I headed back to the boat. I am guttered but the instructors said I just need to practice some more and get used to water being in my face, everything else I was doing spot on so that was frustrating. I ended up doing some snorkelling for the rest of the afternoon whilst the others dove. I did enjoy it and I also did some yoga on the top of the boat which was brilliant. (I really miss yoga) We headed back and my plan was to get PISSED J Well I failed at one thing so may as well console myself. I got dressed up and we headed out to meet the guys. We watched Shutter Island and then went and picked up some drinks to head to our usual spot on the beach and play some drinking games, 21, ding dang dong and some others. After drinking there for a while we then headed to the fishbowl bar and danced there. Jess and Ross headed into the sea and Jess tried to drag me in my nice dress so I went in my underwear. I was not going to ruin my nice dress...Jason and Leo headed back with everyone's belongings to their place including my dress. They came back and we just hung out in the sea for a while (as you do) We headed back to Jason and the guys place and I ended up crashing there for the night as it was late. It was embarrassing as I had to walk back to their place in my underware and you can imagine the comments I got,haha. The next day I headed home showered and then we headed to the Nangyan Island on a long tail boat. It was a gorgeous resort which you pay 100 baht to get into. We sunbathed there for a few hours then headed up to the viewpoint through the mini jungle which overlooks the resort. It was an amazing view from the top and we took a few pictures up there. Later we headed back to the main island and played headstands in the sea. We made it into a competition with me, Ross, Eddie, Jason, Dee and On. Eddie won it and I came third J Later we headed back out and went for a big group dinner and then played our usual drinking games ( see the pattern forming here) I felt terrible after a few hours so I headed back for a nap. Katie came back in about an hour later and I felt better so I headed to the Lotus Bar. When I got there Jason was smashed so we helped himhome and then Eddie, Dee and I tried one of the islands Moon Burgers which was pretty yummy. The next day the girls and I packed up and headed out of our little home in AC Resort to move down to p****Tier. We met the guys in the Island restaurant and had one of these massive pizzas they were all raving about- pretty damn good.Jason was still pissed which was amusing.. They guys headed off to get their boat so the group was now down to 4.. me, Claire, Leo and Katie. Katie was leaving later that night. There was a massive storm and when it passed we headed to the beach to chill out. Later on we showered then went to Seashells which Kerry had recommended and it was delicious.. it was 2 skewers one was fish and one was beef with a potato and salad. EPIC!! The sunset was amazing so we took some pictures. I really do LOVE Koh Tao.. Later on me and Katie split a pancake, chocolate, peanuts and banana.. I LOVE the pancakes (I think I have developed a sweet tooth between the pancakes and doughnuts) Every night I had one and Dee got some free ones every night, working her charm on the man J Katie headed off and I watched Knight and Day which was pretty bad I thought but then I missed the first 10 mins so maybe it was that.. I then wandered around and went back to the room to sleep about 11ish. Leo was already passed out, the last 8 days had taken its toll on all of us J Claire, Leo and I was sharing a room together. Today I moved out of the room we shared. Leo went diving and I have been sunbathing and I uploaded some pictures on FB. My blog site is painfully slow to add pictures to it. The only time I can do it is if I let them upload while I sleep if somewhere has the connection..So excuse the random places for pics!! So I write this blog from the beach chilling out in the sunshine and just enjoying this gorgeous place.. Really I am not trying to make you jealous.. ;) I have been hanging around with Claire and Jeremy today, that's sweet to watch. I am leaving Koh Tao tomorrow morning at 10 to head back to Bangkok, I should be there for 8pm where I will find a room. I may see Jason, Eddie and Dee on Saturday hopefully. I plan to try and go to the floating market to see one, then MBK to get a few new tops and ditch some of my old ones.. Well I have been wearing them for 7 weeks! I also want to do a boat trip and watch the sunset and maybe do a night market but I will see how I get on and also money. I have a little left and don't really want to draw any money out J I leave early on Sunday morning for Perth and I am really excited. I get to see Gary and my friend Laura I met early on in my trip. She has promised me a night out so I can't wait. I have enjoyed SE Asia immensely and I am really sad to leave it. I wish I had more time to do Indonesia but I may try and get a cheap flight from Australia when I am there. I have seen and experienced the most amazing things, food, scenery, people and I have made great friends along the way.. They all know who they are J Bring on leg 2 of the trip Australia!!! !